Washington Park Arboretum occupies 230 acres on Lake Washington and is known for it's diverse and abundant wildlife. 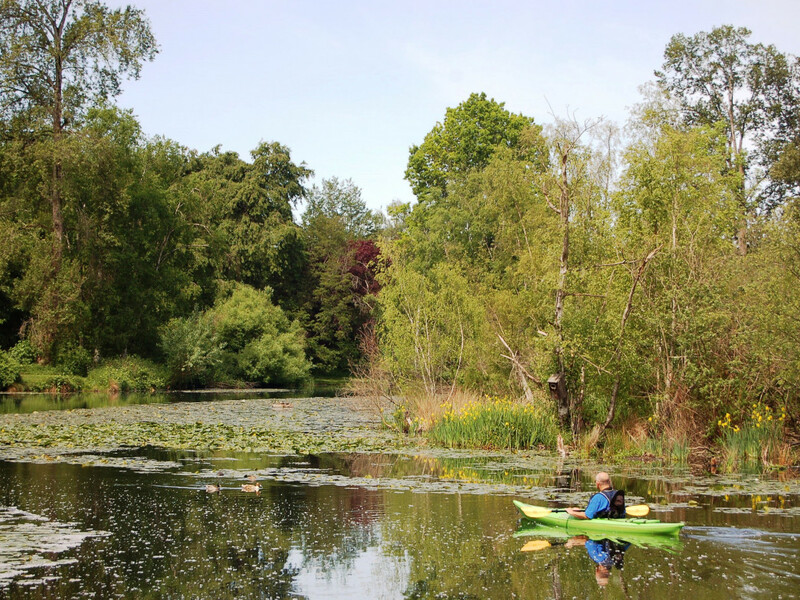 Paddling the shoreline of the Washington Park Arboretum is a convenient adventure into Seattle’s vibrant urban everglade. The water pathways weave past docks, the bridges of the park’s trail system, small islands, and through the local flora and fauna of the city’s largest remaining tract of wetlands. Take your time drifting through the charming cattails, water lilies, purple loosestrife and yellow flag iris. Keep an eye out for the local critters, too: ducks (and, in the spring, their adorable broods), cormorants perched on driftwood, regal blue herons, and the trout and salmon that swim beneath. You’ll have surrounding views of Union Bay, Lake Washington the University of Washington campus, and the Cascades and Olympics as you go. Located right in the city and with very affordable canoe and rowboat rentals available from the University of Washington’s Water Activities Center (from $5-11/hour), this is an activity in which almost everyone can participate. But get there early (or got late): sunny weekends you’ll see long lines waiting to snag a boat. Sometimes the wait can get up to over an hour, as you’ll have to wait for boats to return if they are all in use. Rentals are seasonally available, beginning March 1. The one downside: The Highway 520 bridge crosses over the marshland, meaning that you’ll have the constant hum of traffic to accompany your ride. But paddling under it, you’ll be surprised by what a pretty landscape can exist beneath a major highway overpass! If you want to go for a longer paddle, you can easily get out to the open waters of Lake Washington, or go through the Montlake Cut to Lake Union; just beware of motorboat traffic. Once you’re done seeing it from the water, the Arboretum is also a fantastic spot for a walk or a jog. 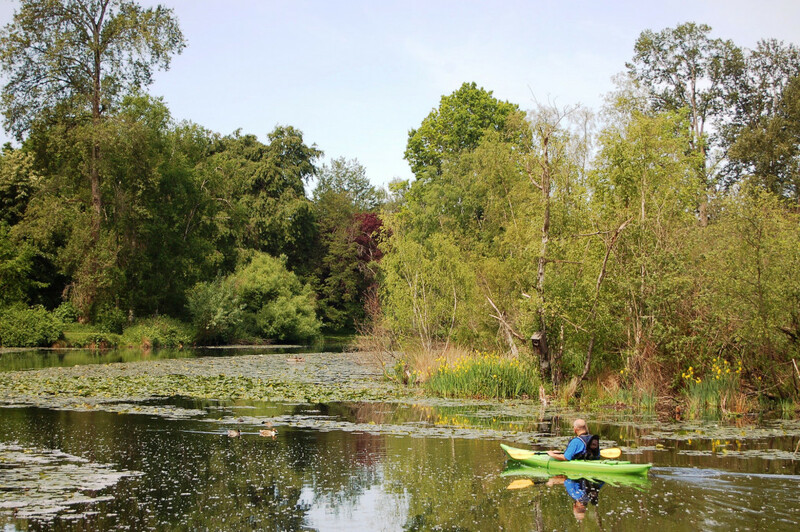 With over 40,000 species of trees, shrubs, and vines from all over the world, the Washington Park Arboretum’s 230 acres of wetlands, woodlands, and gardens contain one of the most diverse plant collections in North America. Wildlife lovers – particularly, bird nerds. American coots, pied-bill grebes, and Canada geese are just a few of the species that frequent the area. Plus, these wetlands provide critical habitat for some of Washington State residents’ favorite endangered species: nesting bald eagles and Chinook salmon. Canoe/kayak launchings are only allowed from designated areas. If you are bringing your own boat, park at the Graham Visitors Center to launch from Duck Bay. If you are renting from the University of Washington, parking can be tricky on weekend – but keep in mind that you can do so for free on Sundays! If you prefer to speed along in a kayak, rentals are available from the nearby Aqua Verde Paddle Club for $17-20/hour. The Arboretum is open from dawn to dusk.